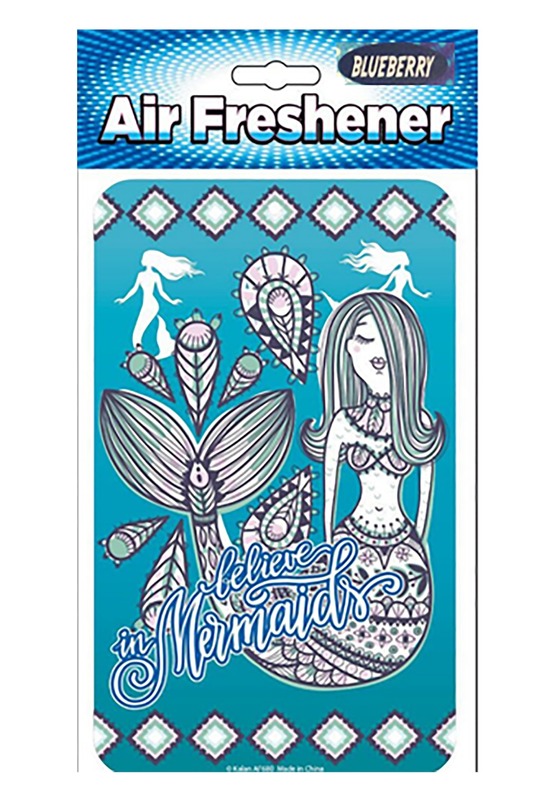 Here's what people may not realize: a mermaid party can have some unfore-smelled consequences. All that seaweed the mermen drag in on their tails can get stuck in the carpet, salt water can wreak havoc on the hardwoods, and don't get us started with the fish fry! So the takeaway is this: Mermaid party in the ocean=glorious; mermaid party on land=a bit smelly...unless you have the right tools. This Mermaid Air Freshener is scented like blueberries (which, interestingly, are mermaids' favorite fruit), and can cover all manner of sea people side-effects. Now, even if your guests bring their pet crabs or seahorses or sea turtles to the bash, you have your shindig all set up to look (and smell) as fresh as an underwater garden. This air freshener is crafted of heavy cardboard, so it can withstand the duration of your party, and beyond. The design—a beautiful mermaid illustration along with the words "believe in Mermaids" (as if you'd need to be reminded! )—is printed on both sides. There's a handy elastic cord for hanging, and if you want our advice, you should pick up a few and strategically hang them around your house. If the RSVP is any indicator, you could have a full house of fish out of water! This little freshener is a tiny detail that makes a big impact on your party. Enjoy gathering all your pals to tool around on dry land!